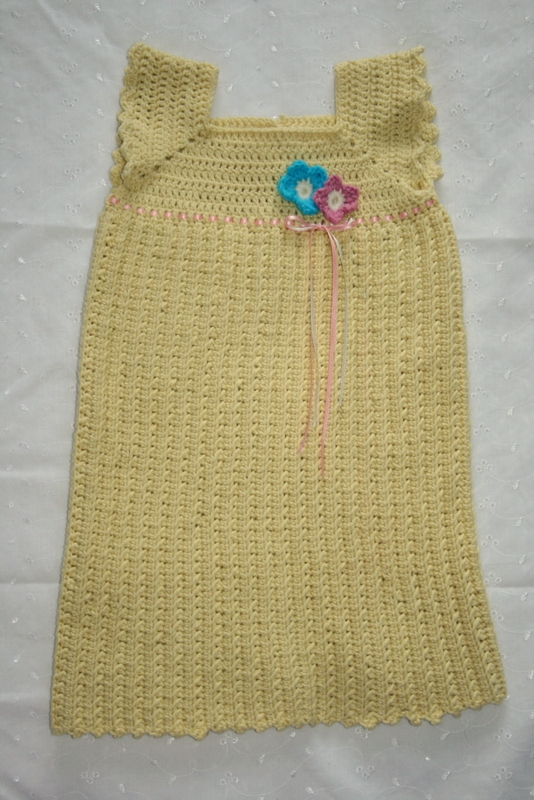 I have finally finished a lovely little dress for Little Miss. I have to say that although I love this pattern and the end product, it has caused me no end of problems! I frogged this dress at least 4 times (and only after I’ve done a few rows of the skirt, which is after hooking the top). I’m sure it’s my fault, I must have got the tension wrong and not realised it or maybe it was because I substituted one bamboo yarn for another, whatever the reason, I couldn’t get the sizing right. 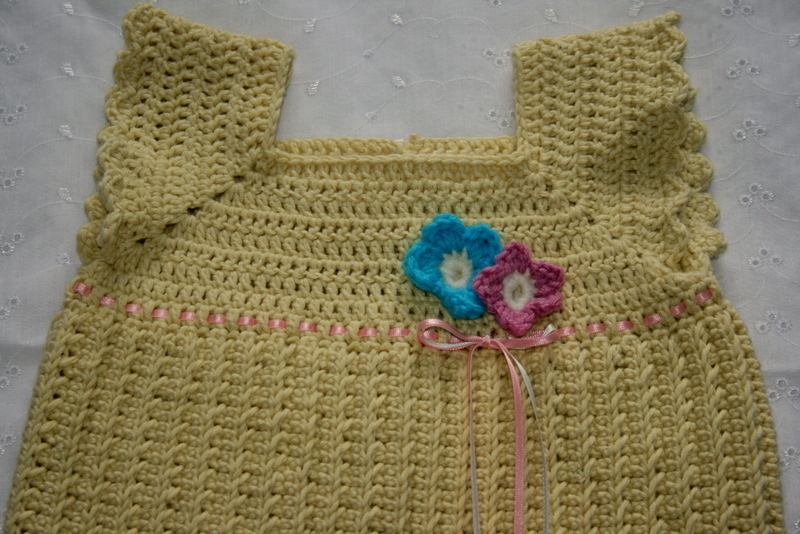 The first time I started making the 6-9months, got half way through, and realised that it was too small for Little Miss already (who at the time was less than 2months). In the end I ignored the sizing in the pattern, made the biggest top part and measured the skirt on little miss to make sure it was the right length. Saying all of that, it was worth it. I love this little dress. What attracted me to the pattern in the first place was the detail on the skirt. I don’t know if you can see it but the stitches are twisted to create a lovely texture. Little Miss loves soft and textured things, especially on her skirts (which she pulls up and strokes her cheek with or pulls it over her eyes). 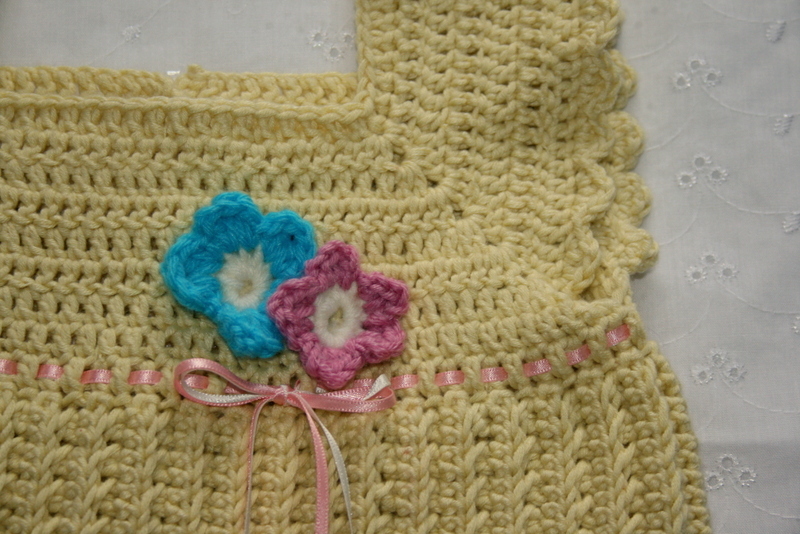 The original pattern has the ribbon threaded like I have done here but I wanted to add some flowers (anyone who reads my blog regularly, knows how much I love flowers). I think they work quite well. I also changed the edging around the ‘sleeve’ as I think this one looks prettier (the original pattern didn’t really have an edging). 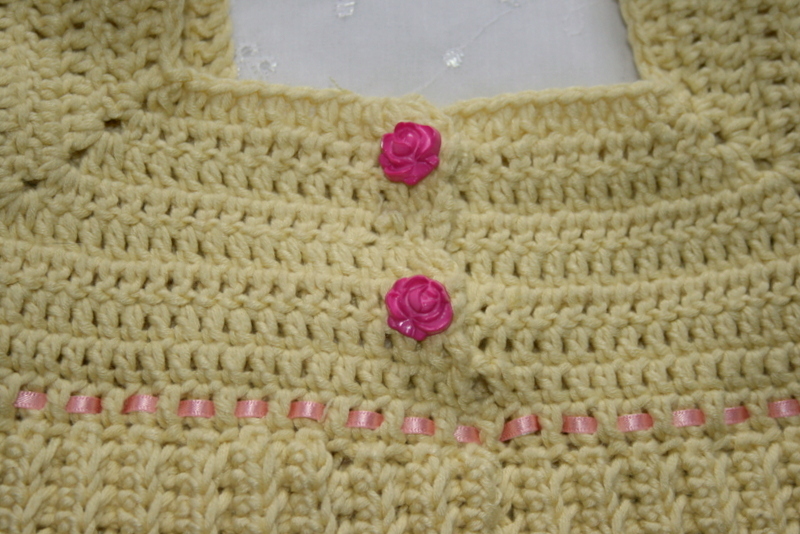 Finally I finished the back off with these sweet little rose buttons. I’ve had them for ages just waiting for something I can use them on (anyone else a button magpie?). Overall, I’m pleased with the end result and can’t wait to put Little Miss in her new little dress!